Doodle Addicts across the globe are gearing up to set out on a road-trip adventure unlike any other. Join us as we band together, traveling across the globe with one single mission: To spread our love for doodling, near and far. Everyone has an important role in collaboration with the Doodle Caravan, and we need your help to create the longest parade of artists that the universe has ever seen! Download the template and draw your mode of transportation - from a camel carrying markers and crayons to a pencil sharpener on wheels to a future hovercraft to everything in between. It’s not about the destination, it’s about the journey and what you drew to get there. Now pick up that pencil, get in tune with your inner compass, and join us on the artistic excursion of a lifetime! This is my Doodle Addicts "Doodle Caravan" drawing challenge. Join the fun at doodleaddicts.com ! Drawn & colored in Procreate with my iPadPro -- I love that app so much. Going on a drive with Miss Brush, How she glides through my world and makes them all lush, Everyday is amazing with her, it's like a vacation, Why wouldn't it be? she gives colour to my imagination. The knight of the quill and their proud mount join the caravan on a search for more creative adventures. Watercolors and water go hand in hand and the sailing paper boat came naturally as a choice. All i wish for a is an elephant friend. A Carnival Caravan fit for a One Year DA Anniversary! Flying high with everything from brush to pen. The subject of all my art inspiration, the teddy bear is hauling all my art supplies on a boat made out of watercolor paper (yes, pun intended) along with my fuel container, without which my art never happens. bellY. beAN. would love to join your caravan. Gone Doodlin' Ink and watercolour. The ancient good old way. The Space Bike takes you to Mars and back. Mine is reflective of the things I enjoy drawing the most: Girls and Cats...and tiny cups of coffee to a lesser extent. Was inspired by Alexander Girard's work as I worked through simplifying some of the elements, but wanted to keep some textural elements that I enjoy using in my own work so much. Joining in on the Doodle Caravan. Transporting into the colorful world of doodles on my doodle caravan! It's like an Ice Cream Van, but for art supplies. I drew it and coloured it with pencils; and because it is meant to spread love for doodling, I made it look doodlee. Time to doodle drive. "Homesick" is not a word in my dictionary. Enjoy the ride of Life. where will the road lead. This is my doodle bus! Perfect for getting away from reality for a little while to make some awesome art! This is a hand drawn doodle consisting of different types of drawing equipment that I often use on a daily basis. If you look closely you may even see me in the picture. I have always wanted to hit the road with a vintage Scotty camper and see the country. I hope I get to do it in real life. 3 friend enjoy on carplane wannabe. for my travel, I do not need so much. This doodle was inspired in many things I like to draw usually. It all comes from different resources such as, me being Mexican, a culture that likes saturated designs. On the other hand, I love Japanese art, that's why I always include a kind of Seigaiha waves (for good luck). Music has always been around the house since I was a kid. My mom loves the Beatles. So, this is an homage to her as well. Actually, she's the one with the purple hair (her favorite color) at the back of the caravan, singing. The people I draw inside the caravan are usually friends and family, and I like to draw them with long wavy hair. Usually, my drawings have these lines that represent the Golden Hour, the time I love the most. In a nutshell, this is a homage to my people, travelling in a holiday, towards the sunset. Finding balance in your art can be quite tricky but that doesn't stop us from going on the creative tour! Dreaming of painting on a health-inspired commute. Donkey power to carry all my art supplies with me on every journey. Doodle for the caravan contest. Creating my own world one drawing at a time. Everyone and everything is on the road for a great doodle journey! This is a square crop of the full picture. There are more characters following behind the doodle caravan creature, I'll just have to share that on my own site. I cropped a drawing of myself out too! Try to spot some illustration celebrities such as Mr. Bingo, Kerby Rosanes and Mr. Doodle! A girl making the long journey to the pencil exhibit in her rowboat on wheels. My homage to my 1970's sci-fi homage. What can I say? I'm a homagenizer. It a pencil plane! Simple and lighthearted drawing. Tried to embrace the whimsical nature of this challenge. My Sketchbook Bus is stocked with art supplies, good music, lots of coffee and creative friends! Hooray for the 'Doodle Caravan'... Let's enjoy this artistic adventure together! "Logic will get you from A to B. Imagination will take you everywhere"_Albert Einstein. Your brain is the only vehicle you will ever need to go to the places you never thought you would reach! The piece illustrates what I feel about my progress in art over the years. Sometimes I feel like I'm riding a horse and then I look back at my progress and see that I've been moving at a snail's pace. I packed up the old jalopy with everything I wanted to take with me on my travels, including plenty of art supplies and all of my little critter friends. The art studio go-llama is two friends who carry you and your art studio where you need to go, providing they get their leg-o-motion figured out. My favorite mode of transportation is my running shoes. Now that this is done, it's time to hit the road! Black & White drawing of an Origami boat sailing on a wild river, with art supplies floating along side. There are also starfish for dreaming, and a nice hot cup of coffee. The Ink-wobble. A two-armed gyroscopically balanced drawing machine that allows the artist to draw large drawings in much less time. It's back inkwell can hold up to 25 gallons of India-ink. A Doodle Caravan with animal friends. Ink and watercolor, 7 x 7 inches. I made this drawing for the brave people of Venezuela, my home country, who are, once again, fighting for their freedom. We have had a dictatorship for the last 20 years, and for the first time, we are very very close to ending the nightmare. I haven't been home for the last 3 years and can only see my family once a year. It is not easy being an immigrant, missing my home, my family. Don't get me wrong.. I love Canada. It has welcomed me with open arms and I will always be grateful. Thank you for taking the time to read this, because this "doodle" was made with so much love and I think that it will be a great addition to the Doodleaddicts Caravan. I have the most votes, am I the winner? Not necessarily. As stated in our guidelines, the public voting from the community helps bring the most popular art submissions to the top. 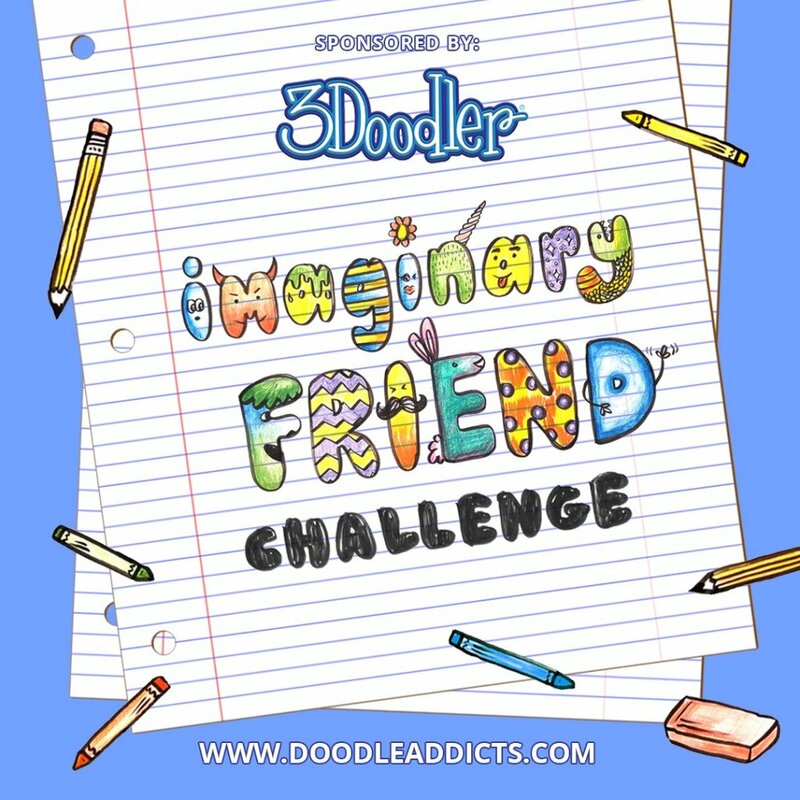 Once the public voting is over, the editorial team at Doodle Addicts (along with the sponsor), will then vote internally from the top group of submissions. I made a mistake, how do I fix or replace my entry? You can delete and resubmit your entry anytime before the submission deadline. Just click on the “Replace Image” button below your submission (on the challenge page) to delete your original submission and replace it with your new one. Am I allowed to have my fans, friends and/or family vote? Yes, of course. We definitely encourage you to spread the word on your participation in this fun drawing challenge. There are so many good ones! Can I vote for more than one? Yes! You can mark one, two, five or all of them as your favorite. What do you do about cheaters? Any fake votes we catch will be removed. Let’s keep this fun everyone, the prize is just the cherry on top. Make sure to read the guidelines and the terms and conditions, most questions are answered there. If something is still not clear, feel free to email us and we’ll try to help.